5 Points "No! Anything but that! Please! I'm sorry! Please forgive me!" 5 Points "Ugh... Sorry... It appears I've underestimated the enemy. I leave the rest to you." 5 Points "The gods have given me beautiful wings. So majestic, so soft. Why not embrace the gift of flight?" 5 Points "The flame in my stomach... I feel its power. Take this!" 5 Points "Yes... This is my true form, but my body has been damaged. I took on another to avoid the pains of living." 5 Points "Argh, that burns! Just who is this guy? I thought I was going to die." 5 Points "Also stretch before flying, Big Bro!" 5 Points Headmaster: "Yes, he is my son. Born from the light of dragons and the darkness of balrogs, we named him Eclipse." 5 Points Gene: "We're twins, technically, but I was born first. I think I hit Eric too hard when we were still in there, making him the way he is now." 5 Points Flarewing: "Why the heck is a giant castle out here while we have only been sleeping on the dirt during this entire retreat?!" 5 Points Frostbite: "Hold your ground! We won't let them hurt big bro!" 5 Points Grayscale: "My body rejects color altogether. You think I've never tried dying my fur? it doesn't work." 5 Points Eric: "It's nice to rest every once in a while. Not just at night, but under the warmth of the sun too." 5 Points Headmaster: "As long as you are here, you abide by my rules and restrictions. I am the ringleader, and you are nothing more than my winged tiger." 5 Points Eric: "I can't fly, so he pretends to be unable to as well to make me feel better. But I know he sneaks out at night for a quick flight occasionally." 5 Points Violetbolt: "My speciality is thunder. Violet thunder. It has the speed of light, the burn of a flame, and the beauty of violet." 5 Points Flarewing: "It feels so cold. Why does it feel so cold?" 5 Points End with a final score of 10,000. 5 Points End with a 50% hit rate. 5 Points Watch through the opening video. 5 Points End with a 75% hit rate. 5 Points Frostbite failed to escape. 5 Points Kill one of Wingsnapper's clone. 5 Points End with 1 kill. 5 Points Visit my page (and feel free to follow me). 5 Points End with 10 kills. 10 Points End with a 95% hit rate. 10 Points End with 25 kills. 10 Points End with a final score of 50,000. 10 Points End with 50 kills. 10 Points End with a 90% hit rate. 10 Points End with a final score of 100,000. 25 Points End with 100 kills. 25 Points End with 250 kills. 25 Points End with a perfect hit rate. 25 Points End with a final score of 500,000. 50 Points End with 500 kills. 100 Points End with a final score of 1,000,000. 100 Points End with 1000 kills. 10 Points Find Frostbite, again. 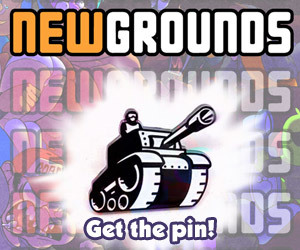 Newgrounds Lover 10 Points Secret Medal: Unlock this medal to view its details!